Suppose you are looking at a stereo anaglyph : left side is viewed red, and right side is viewed blue. All the folowing is true for all kind of viewing, but anaglyph are considered here for convenience. All points that are exactly overlapped from left to right views are seen on the screen, or on the paper. They are said to be at the stereo window. All them are comfortable to see, whatever their position on the scene. 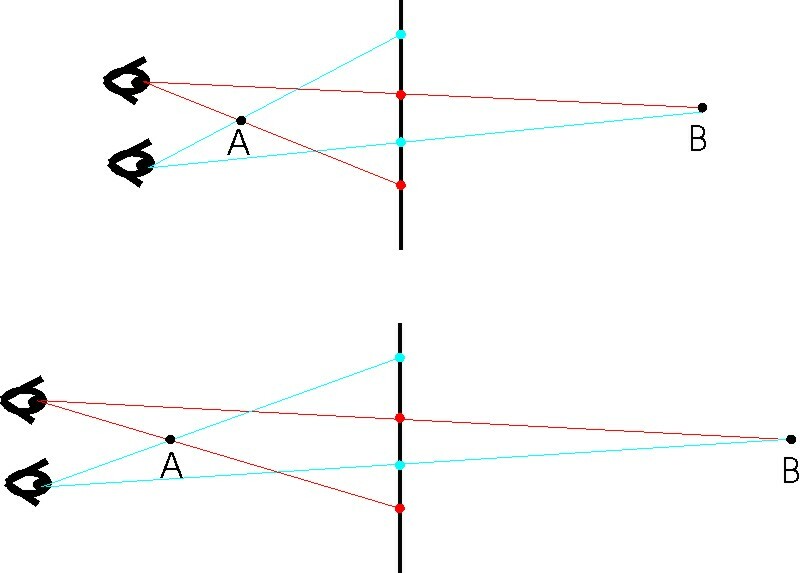 When a red/left point is displayed on the right side of its corresponding blue/right point, the resulting point (in black on the diagram) is viewed in front of the screen, or in front of the paper. It is said to be in front of the stereo window. This front position need a big shift from displayed red and blue positions. Then, when coming near the border, one of them is going outside of the image and lack to the stereo view. This is called a stereo window violation. This often completely breaks the stereo effect for many viewers, and is to be avoid. Left and right views must be horizontally placed together so that all points of the scene that are coming out are far from the image borders. When a red/left point is displayed on the left side of its corresponding blue/right point, the resulting point (in black on the diagram) is viewed behind the screen, or behind the paper. It is said to be behind the stereo window. This behind position need a smaller shift from displayed red and blue positions. Then, when coming near the border, the lack of one of them is much less damageable to the stereo effect. For academic stereo (best comfort at viewing), left and right views must be horizontally placed together so that all points of the scene are to be seen behind the window, and the nearest object of the scene is to be seen at the window. When you are increasing the observation distance from a stereo, the apparent size of the image is reduced, and the apparent depth effect is increased. On the contrary, when you are reducing the observation distance, the apparent size of the image is increased, and the apparent depth effect is reduced.